One thing that Elysian Brewing is reliable for is having a selection of rotating seasonals, specialty beers, and one-offs that make any visit to one of their three pubs worthwhile for even the most die-hard beer geeks. You can almost always find something new it seems. But, for the past several months their Elysian Fields Brewery was dealing with issues with their brewing system that required some patch-work maintenance and finally the replacement of a brew kettle. During this period, you would have noticed an increase in the amount of guest taps at all of their locations, and less of those special Elysian beers you might have been looking for. David Buhler of Elysian informed me last week that they are once again brewing at the Elysian Fields location, and that things should be back to normal soon. In addition to keeping up with normal demand, they’ve also been busy getting beers ready for the upcoming Great Pumpkin Beer Festival on October 16 & 17. 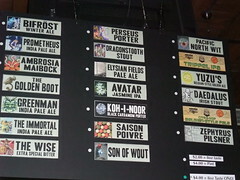 In spite of the issues, they did a great job of rotating in guest taps such as the fantastic Alpine Hefeweizen, hoppy beers from Firestone Walker, and plenty more. dang it. I was just getting used to them taking four kegs of Kolsch a week. Welcome back to the Northwest Kevin Watson !